Everyone knows passwords are important. But why are they so vital? Passwords help ensure security and confidentiality of information you have stored in accounts and on all your various devices and computers. The scary thing is, one of the most common ways hackers break in is by simply guessing passwords. 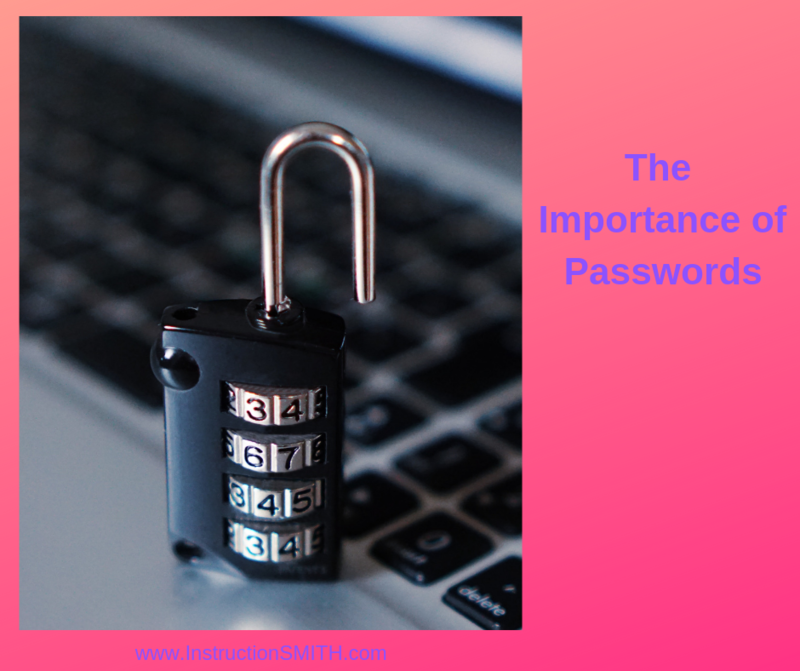 It is your responsibility to make sure that all your account passwords are as difficult to figure out as possible. Passwords that are easy or commonly used allow intruders to gain access and control almost any device. Using passwords that are difficult to guess will make it a lot more difficult for common hackers to break into your devices and accounts. The more difficult you make your password, the lower the likelihood that your computer and online accounts will be subjected to unwanted intrusions. For many of us, the biggest barrier to setting multiple, complex passwords is the fear of forgetting them. Password managers are an essential tool to keep your passwords safe. Don’t trust your memory or use only a few passwords that you can remember. Instead, use a password manager. Free apps include LastPass, Dashlane, KeePass, and 1Password. Using one of these password managers make it easy to use complex, unique passwords. You only have to remember the master password that opens the password manager. Most of them also have random password generators to help you pick passwords that can’t be guessed. Try to create a more secure password. Think of a combination of letters and numbers that will be easy for you to memorize but will not be easily recognized by anyone else. Maybe use titles of your favorite books or movies and use the first letter of every word, replacing certain words with numbers or symbols. For example, replace the word “for” with the number 4 or the word “number” with the # symbol. Passwords should be long (at least ten characters) and complex. Be sure to use a combination of upper & lower case letters, numbers and symbols. Never write passwords down, because that will make it easier for the passwords to be stolen and used by someone else. Never use the same password for two or more devices or websites. Hackers who break into one will most definitely try to use the same password to take control of others. On mobile devices, a PIN or pass code is needed. This acts just like a password for a computer, but it may have a minimum of only four characters or digits. Try to make it something that is not personal or easily guessed. Set your pass codes for devices to time out after a short period of time. Once it times out, the code then need to be re-entered. Ideally, the timeout should occur in no more than 20 minutes, although shorter periods between time-outs are best. You should change your passwords every three months and use a different password for every website you visit. This can be a lot of work but it beats having to recover and put everything back together after being hacked.